We would like to thank Bravely Told Games for the preview copy of Cult Following used for this preview. Other than receiving the preview copy we at Geeky Hobbies received no other compensation. Receiving the preview copy had no impact on the content of this preview. Cult Following is played in rounds. For each round two or three of the players take on the role of a cult leader while the other players take on the role of recruits that are thinking about joining a cult. The cult leaders draw five sign cards. Each card has two different ideas/topics on it. Players look through their cards and choose one of the ideas/topics from three of their cards. The other two cards are discarded. After everyone has chosen their cards for the round, each player introduces their cult to the other players. Each player uses the three cards that they have chosen as an outline for their cult and the player can add any additional information they want in order to make their cult more appealing. Here are the five sign cards that one of the players drew for one round. This player could decide to make a cult around time traveling vampires that are going to bring eternal darkness to the world. After all of the cults have introduced themselves, it is time for the recruits to ask some questions of the cult leaders. One of the recruits draws a question card and reads one of the questions on it to all of the cult leaders. Each cult leader then answers based on how their cult would answer the question. The recruit chooses which answer they thought was their favorite/best and gives the question card to the corresponding cult leader. This represents one new cult follower. The first player to get two cult followers/cards wins the round. This player gets to decide the fate of the other cults. The recruit has decided to ask the cults about a perfect day for their cult. The time traveling vampire cult might respond that a perfect day would include getting turned into a vampire by one of the time traveling vampires. If players want to play another round each player can change roles and new cults are formed. Cult Following also has some additional variant rules which can be found on the official game website. We here at Geeky Hobbies have played a lot of the Apples to Apples style of party games including: Faces, Mad Libs Game, New Yorker Cartoon Caption Game, Quip It, Snake Oil, T-Shirt Game, along with other games that we have yet to review on Geeky Hobbies. While these games aren’t particularly complicated and you could even argue that they are more experiences than games, I generally like these type of games. I bring this up since today we are looking at Cult Following which is another game in this genre of party games where just having a good time and making the other players laugh is the main goal of the game. The first thing I want to address is the theme of Cult Following. Obviously cults are not something to joke about since they can ruin people’s lives. It is understandable that some people may be turned off by the theme of the game since it is not going to appeal to everyone. The game takes a really light tone with the theme though. It isn’t a game like Cards Against Humanity that tries to be offensive just to be offensive. I would say that the game is more of a teen to adult game though. A couple of cards may be a little questionable for younger children and with the theme of cults I don’t see the game really being for children. None of the cards are that bad though so the game could probably be played with teens. If you like games like Cards Against Humanity though you can make the game as dirty/offensive as you want as you just have to use the cards as the basis of your cult and can elaborate wherever you want. Note: After talking with the designers they are considering removing some of the more questionable cards from the normal deck and adding it to the “adult” deck. Cult Following can really shine with the right people. Creative people that are able to weave a good story around their cult and give detailed answers to questions are what make Cult Following really stand out. The game has plenty of opportunities to create laugh out loud scenarios. Being in a moderately creative group, my group came up with some funny cults but there were also some duds as well. If your gaming group plays a lot of these type of games and some of the players are really good at them you will have a lot of fun with the game. Cult Following is not going to work great with every group though. Shy people who aren’t going to elaborate on their cults can play the game but the game might become a little dull if the players only read off what is written on the cards. The game thrives on creativity and players putting effort into creating interesting cults. Cult Following requires quite a bit more creativity than a lot of these Apples to Apples style games. The game will thrive with good storytellers and will probably flop with shy or uncreative people. Usually shy/uncreative players will end up playing as the recruits since then they only have to ask the questions and choose which players gave the best answers. The one element of Cult Following that I found really interesting was the idea of the question cards forcing players to defend their cults. It is hard enough trying to come up with a creative/funny cult but it becomes really interesting when you need to answer questions based on how that cult would respond. Some of these questions can force you to really think to come up with a good answer. These questions can lead to a bunch of ridiculous answers that could bring the whole group to laughter. Like a lot of these type of games I would consider Cult Following to be more of an experience than a game. There are winners and losers in the game but I feel the real purpose of the game is to just have a good time and make the other players laugh. The scoring system is pretty typical for these types of games and works fine. Only having to get two followers though means that rounds of the game can be really quick unless the players get really invested in their cults and do a good job describing them and putting details into their answers. I would say that most rounds will last around 10-30 minutes. Our group decided to slightly alter the scoring rules where each player (a four player game) was the recruit in one round and a cult leader in the other three rounds. Players kept their cards earned through all of the rounds and whoever had the most cards after everyone was a recruit the same number of times won the game. I would also think about implementing one of the alternate rules and reward the player who gives the best cult description before any questions are asked. I would say that Cult Following ‘s components are pretty good. The card stock is good and the artwork is pretty nice. The cards are pretty simple though since cards don’t have much on them other than the topics/questions. I think this is a good idea because there really are no reasons to clutter the cards with items that don’t really matter. As far as card quantity I would say it is pretty good with just the basic set. The pre-Kickstarter set has 85 sign/word cards and 25 question cards. The distribution of cards could be different for the Kickstarter set. While you might end up repeating questions a little more than you would like, I think the basic set should work well for quite a while before it gets repetitive. 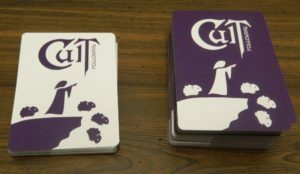 Cult Following also has two planned expansions which should expand the game to the point where you shouldn’t have too many problems with repetition. Cult Following is an interesting experience/game that will be hilarious for some groups but may fall a little flat for other groups. For the game to really excel you need a creative group who are intrigued by the theme. 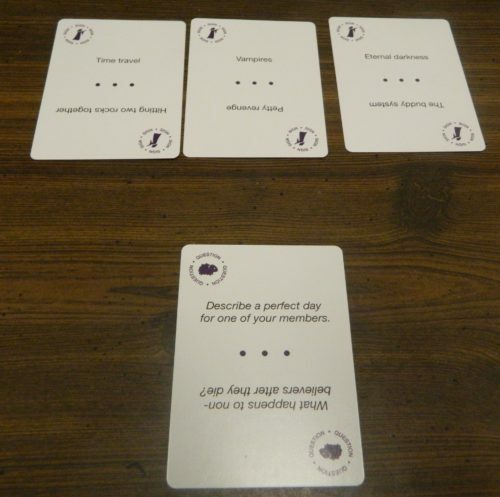 A group of shy or uncreative people may not really enjoy the game that much since the game relies on the players being creative while forming and describing their cults. If you have the right group of creative players Cult Following can be a blast and very funny. 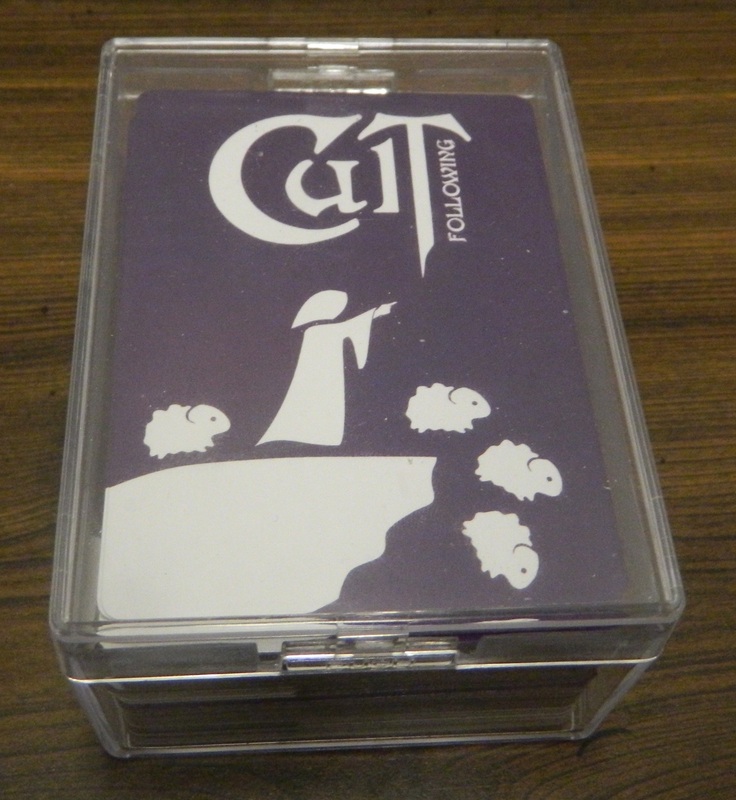 If you would like to purchase Cult Following you can purchase it on Drive Thru Cards right now. Cult Following’s Kickstarter campaign runs until September 25th, 2016. If you pledge around $26 you will receive a copy of the game. If you are interested in the Kickstarter campaign you can check it out here. Will thrive with creative storytellers. The question cards are an interesting addition to the game to help spur discussion. May not work so well with shy or uncreative people. While not offensive, the theme may turn off some people.